Published: Aug. 5, 2011 at 01:55 p.m. Updated: Sept. 24, 2012 at 04:14 p.m. 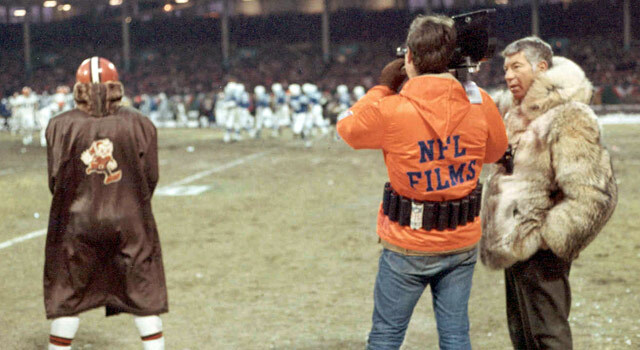 The vision of NFL Films founder Ed Sabol helped revolutionize how sports are presented. Working for the NFL affords you the opportunity to rub elbows with many of the game's greats -- past and present. But I never found myself more intimidated to meet someone than when I slinked into Steve Sabol's booth at Cowboys Stadium hours before kickoff at Super Bowl XLV to congratulate him on his father's selection to the Pro Football Hall of Fame. Ask any NFL fan under 50 and odds are that they will admit that the reason they love football is because of the Sabol family and NFL Films. I would almost venture to say that if you don't love NFL Films, odds are that you do not love America. Although, that might be a touch strong. But spending time with Sabol I really felt like I was talking to NFL royalty. I couldn't help but thank him and his father for all of the wonderful memories that they have provided throughout the years. So it only seems appropriate that we take some time to look at six of the coolest things about NFL Films. Reality TV is one of the worst things to happen to television since David Hasselhoff was out-acted by a talking car. But having "Hard Knocks" (watch on Hulu) makes the collateral damage of the "Real World," "The Hills" and Paris Hilton worth it. Because if it wasn't for "Hard Knocks," we would have never known that Rex Ryan has a rather (expletive) colorful (expletive) vocabulary. I mean, what the (expletive)? There are three things on cable television that will make me drop everything to watch to completion -- "Heartbreak Ridge," "Storage Wars" and any episode of "America's Game" (watch on Hulu) that does not feature the 49ers. My personal favorite: watching Joe Namath lead the upstart Jets to a win over the Colts in Super Bowl III. What is interesting to note here, Steve Sabol admitted that he edited the NFL Films version of Super Bowl III to make it seem that Johnny Unitas nearly led the Colts on a comeback. I love that passion from Sabol. One of my first introductions to comedy was Jonathan Winters, who appeared on "Scooby Doo" and on the NFL Films' football follies (watch on Hulu). And to be honest, as a youngster it was hard to top appearing on "Scooby Doo" or NFL Films. Watching Winters was one of the main reasons why I wanted to get into comedy, which is great for me but probably leaves the majority of you cursing his name. 3. The NFL stands for "Not For Long"
Jerry Glanville might be the most eccentric coach in NFL history, swathed in black and leaving tickets for Elvis at the will-call booth. But who could ever forget his classic quips during his appearances on NFL Films? The most famous being this clip, with Glanville telling a referee that the NFL stands for "Not For Long" if he keeps making calls like that. The same also goes for coaches who don't win Super Bowls, too. Ed Sabol came up with the genius idea of putting a microphone on a coach because, as he explained, what fan wouldn't want to hear what was happening on the sidelines? I sure wanted to hear it. The biggest star to ever emerge from the mic'd up series is no doubt Hank Stram, who agreed to wear a wire while leading the Chiefs to a victory in Super Bowl IV (watch the highlights on Hulu). The thing that truly made NFL Films was the voice of John Facenda and the magical score that went with it. Close your eyes right now, and you can hear Facenda saying "The autumn wind is a pirate, blustering in from sea ..." with that great NFL Films music. Of course, you could also push the play button and hear it for yourself. You can write your favorite things about NFL Films to me via Twitter or via Facebook. Oh, and be sure to catch the latest on the Dave Dameshek Football Program.